Tate fine art prints come in four standard sizes and will have a white border around the actual image; the size of this border is determined by the proportions of the original work. 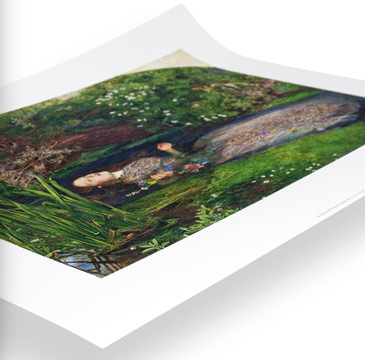 We use 300gsm Purcell Ultrasmooth matte fine art paper for these luxury fine art prints to create museum-quality reproductions. A smooth, matte, bright-white finish delivers masterful colour matches, image stability and excellent durability. Fade resistant for more than 200 years. 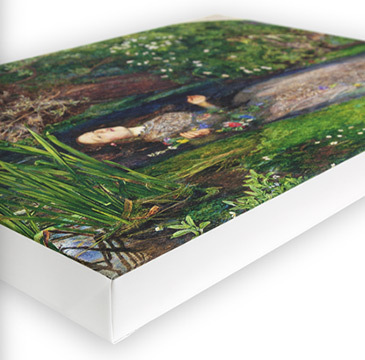 The longest edge length is 40cm for small, 60cm for medium, 80cm for large and 100cm for extra large canvas prints. The length of the shorter side varies between images as it is determined by the proportions of the original work. There is no border on canvas prints. A matte, bright white, specially developed 270gsm inkjet canvas gives a subtle textured finish without cracking which has been hand-stretched over a concealed pine frame approximately 45mm deep. We add a 3mm board behind the canvas to maintain tautness and the finished product is ready to hang. Produced by skilled craftsmen in the UK.